The wonderful thing about photography is that it is timeless. We capture fractions of a second for you to cherish throughout your life. What’s even better is that there is no age limit on who can be photographed, no matter what the occasion. Here at Pacific Dream Photography, we have photographed as young as newborn children to great grandparents. We believe that life should be cherished and special moments can be captured throughout one’s life through the lens of a photographer. In Laguna Beach, we have photographed a child’s first steps on the sand and first time touching the Pacific Ocean water. We’ve also had the pleasure of photographing milestone anniversaries, engagements, and Weddings here in Laguna Beach. To make your photo session as memorable as possible, we recommend considering to bring a few things to make it extra special. It’s common to see customized shirts being made for your vacation. Especially with large groups, this adds a fun element into your photos when looking back at them later on. The second, if you’re celebrating a birthday or engagement, is to bring balloons or other props to make your session unique to you! If you’re celebrating a baby-moon and expecting, you can bring your ultrasound and baby shoes as props for a maternity shoot. Whatever you think will make your photography session more memorable, please let your photographers know! It’s our passion to document these important moments of your life. So whether you’re celebrating your first anniversary or your 50th, the whole family is there together, or you are by yourself, we see no limits on your photography session and are here to capture memories for you. Family Photography | Including our furry friends! Pick a pet friendly location. In Laguna Beach, all beaches are dog-friendly within certain months of the year. Beach photography is perfect for animals because you can find your own perfect corner to yourself. It’s important to check beforehand if the location you have in mind allows your pets to join. Props! Clothes aren’t just for humans! Feel free to dress up your furry friends for the occasion. At Montage Laguna Beach, proposals and pet photography go hand in hand. One idea is to have your dog dressed up with the ring around their neck! Walk them beforehand. We all know that dogs get excited easily, and when they know they are getting out of the house, they can get a little crazy. If you take them for a walk beforehand, it relieves some of their energy, making them slightly more calm for the photos. Bring treats! Dogs can become easily distracted, especially in an unfamiliar area with new people and smells. Bringing treats can help them focus on where the camera for a beach photo session. Have an extra friend/family member come along to help. Although you definitely want to have your dog in the photos, sometimes you need a little break. Having an extra set of hands will take some stress off your shoulders. It can also help by having the extra person handle the treats so the photographer can focus on capturing the perfect moment. "Candid" in the photography sense, describes an informal photo, taken without the subject’s knowledge. "Candid", however can also be used more generally to describe something that is both truthful and straightforward. It’s use in photography is often understated and draws on both definitions. A recent portrait session at the beautiful Montage, Laguna Beach in Southern California, perfectly captured the essence of great candid photography. Candids require a keen attention to detail and the ability to always be present in the moment. A family holding hands, a loved one running on the beach and even sand covered feet, were all brief moments captured during the family's sunset experience session. Originally the family was planning on a more traditional, portrait family photo session. What they didn't realize was that their photographer was actually capturing both styles of photography. She was clicking away at the family poses, but in between, she was also capturing those brief moments when the family was relaxed and simply enjoying their time together. Ultimately the photographer was utilizing her mastery of candid photography alongside her planned portraiture. We were able to surprise the client with both beautiful and detailed moments from their family vacation at the Montage, Laguna Beach. The vows pronounced during a wedding are a sacred promise and expression of love. However, over the course of many years, the weight of those initial words can often be lost in the hectic and busy days we call life. After 10 years of marriage, and two adorable daughters, this happy couple wanted to show their continued devotion to each other by renewing their vows at The Ritz-Carlton, Laguna Niguel. They shared an elegant, yet simple celebration. The family dressed in breezy all-white attire with pink rose and baby’s breath hair wreaths, which were color to contrast the subtle white outfits. To us, it was the a picture-perfect palette to match the warm sunset colors present as they said “I do" for the second time. For events such as this, the use of props can be a fun and different way to capture the experience. This family brought a "Married Again" sign to use in their pictures, which was a great compliment to the beach setting photography session. The sunset on the evening of the vow renewal was absolutely beautiful. Our photographer was able to capture stunning family portraits and candid images with shades of orange and pink colors reflecting off the sand and water. Our Laguna Beach Photography Team had a wonderful time capturing this lovely vow renewal ceremony. We were honored to be a part of their celebration and give them beautiful images to add to their collection of memories. Great family portraits by a professional photographer are a wonderful addition to every family’s home. There are so many components that work together to create beautiful photos, and some of the smallest details can make the biggest difference. One easy addition that can make a large impact is the outfit worn during your photo session. 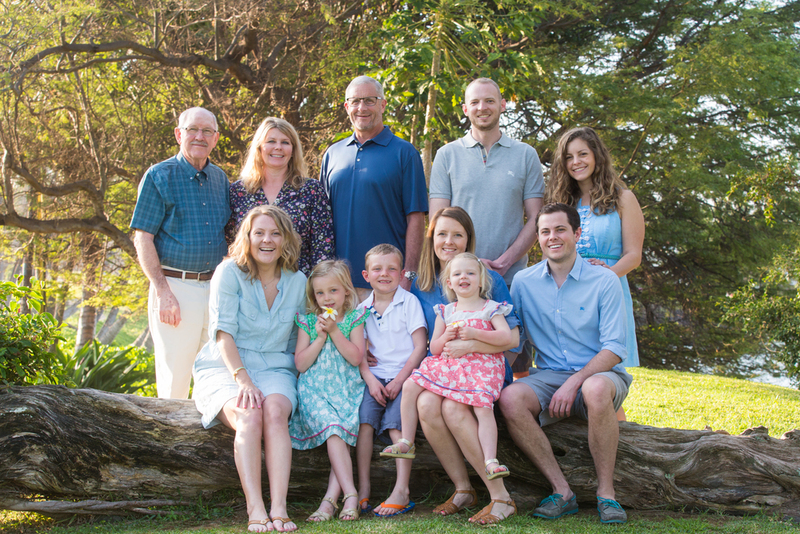 Whether it’s a Hawaii beach photo session or a photo shoot in California, choosing a set color to coordinate between all family members can really help pull a photo together and give the entire family a cohesive appearance. This family chose to wear all white for their sunset photo session in Laguna Niguel. During times such as sunset where the colors in the background are a variety of vibrant warm palettes, choose brighter colors. An all-white wardrobe can work in a late afternoon beach photo session, as seen in these photo samples from a shoot at the Ritz Carlton in Laguna Niguel. These colors can help set apart the person from the scene and draw attention to not only the beautiful scenery, but also to those being photographed. For photo sessions during the day when the sunlight is a bit more intense, avoid white and choose colors such as coral, oranges and salmon (just an example of the many colors which would work.) These can help add to the overall coloring of the photo, and also not have the attention drawn to the brightness of the clothing. Sisters in white vacationing on the West Coast captured by our California photographers. When the entire family is wearing the same color, it ensures that no family member will be lost in the setting compared to the others. This would also ensure that the focal point of the photo goes to the whole group. Having everyone be synced also adds a level of professionalism to a photo over a relaxed look of each person wearing a different print. No matter what, our great photographers will make every member of the family shine and provide absolutely amazing photos. However, extra touches, such as clothing choices, really take ordinary photos and make them extraordinary!